A wheelchair accessible bathroom requires extra modifications because every fixture and construction element must be designed to allow easy of use for those in wheelchairs. disabled, which is barrier free in all aspects of design. to 19" and weighs 35 lbs. or more, although there are several other sizes available that can accommodate various body types and purposes. The largest size available is generally 24 to 34" wide and weighs at least 35 lbs. If you are designing a new handicap bathroom or modifying an existing bathroom for wheelchair access, always plan for the size of wheelchair that will be used in that area of the home. If, however, you are constructing a new bathroom with general handicap specs without a specific mobility device in mind, always allow for standard size wheelchair accessibility features. Here are some design and remodeling tips for making each area safe, accessible and easy to use for anyone who uses a wheelchair in a residential bathroom. You can plan for either a tub or a shower, but the fact is, that a stand-alone shower area is generally best for those in a wheelchair. It's much easier in which to maneuver and is much safer than having to transfer to a tub and back again. Plus, there are additional handicapped accessories such as shower wheelchairs, if needed, which are specifically designed to be rolled directly into a barrier free disabled shower area. An additional accessory that works well for the disabled is a full body dryer that can easily be install in the shower area, for easy drying. 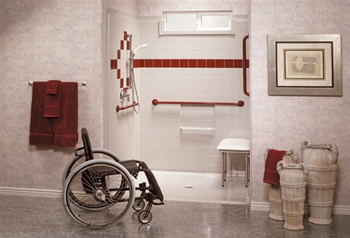 Select a handicap shower kit with doorless entry and without an enclosure. (If adding a privacy curtain, be sure that it is secured well, so that in the event of a fall, the user can grab on to it for support. Make sure there is roll-in access to the shower. Install a sloping drain for easy and quick water drainage. Install a wall-mount shower seat if needed. Install a slide bar shower and hand-held showerhead. Add plenty of grab bars in the shower area for additional support. Electric fixtures and the placement of electrical outlets or switches must be modified from conventional bathroom specs in order to create proper wheelchair access. Electrical outlets should be a minimum of 18" in height from the floor, with any countertop outlets placed no deeper than 21" from the edge of the countertop. You can also use an electrical strip that folds down from the cabinet for extra outlets that are easy to reach. 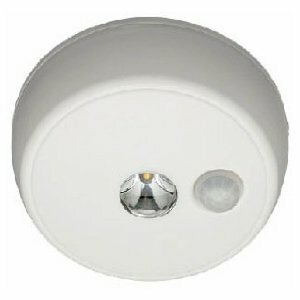 Replace typical lights with motion-sensor or voice-activated light fixtures. Install a vent fan to reduce moisture and help avoid slippage. Countertops should be installed 34 to 36" in height for those who are able to stand, and 30 to 32" for full-time wheelchair users. Allow for a clear space underneath the countertop and handicap sink that is 29" high x 32 to 36" wide. You can use folding doors or install rolling cabinets to create clear space, if needed. Be sure to extend the flooring up under the countertop area, even if you're using roll-away cabinets. Also, insulate the exposed pipes or build a protective panel to avoid possible burns from hot water pipes. Install the sink 21" from the front edge of the countertop to allow for easy reach. (If needed, you can mount the faucet and controls to the side of the sink for better access. Installing the correct flooring for a wheelchair accessible bathroom is a must, since not all materials make it easy to roll on. Other disabled bathroom flooring such as cork may be perfect for different types of disability use, however, cork is not a good solution for wheelchair access. It offers a cushioning effect and impedes smooth rolling. The best flooring coverings include vinyl, ceramic or mosaic tile. Commercial vinyl flooring is perhaps the cheapest, easiest and smoothest floor solution for wheelchair use, although many people opt for ceramic tile in a home bathroom since it is highly durable. Vinyl flooring meets general ADA bathroom requirements for safety and accessibility. You have probably noticed that many public facilities use a commercial grade vinyl block tile. Note: The one pitfall to using ceramic tiles for flooring is that the grouted crevices can cause a rough ride and lack of overall smooth surface for maneuvering. If you use the small, mosaic tiles, the joints aren't much of a problem because they are more narrow and create a smoother surface. Vinyl or mosaic tile is generally the best for a wheelchair bathroom. Do not use rugs on the floor. Conventional doorways are not always accessible for either electric power chair or manual wheelchair use, so it's generally necessary to modify or widen the bathroom doorway. Residential disabled bathrooms should be between 32 to 36" wide so that any size wheelchair or walker can easily move through the doorway. If you're renovating an older bathroom, you can sometimes install a pocket door in place of your existing door and gain enough space for clearance. You can pick up a pocket door hardware kit at most hardware stores. They are universal and are adaptable to just about any bathroom door. Of course, it's always easier to install a pocket door in new construction rather than trying to retrofit it for a standard doorway. If you're not a savvy DYI'er, you can always consult a builder for help in installation. Gain more clearance space by installing swing-clear hinges in place of standard hinges on conventional doors, so that they swing outward rather than inward. Opt for a pocket door for best use of door space, especially in a new construction or major renovation project. Using the toilet is one of the most challenging functions for many disabled people, other than taking a shower or bath. It's imperative to provide the proper wheelchair accessible modifications to the toilet area and to make provision for a wheelchair commode, if necessary. It is necessary to first insure that a toilet is the correct height, which should be between 17 and 18" high. There are many ADA approved home mobility aids on the market that make choosing the right one an easy task. Choose a raised toilet seat adapter in some cases. Sometimes it is possible to simply provide a raised toilet seat instead of having to install a whole new toilet, especially if you're just remodeling. Install a wall-hung toilet. A wall-hung toilet is the fixture of choice for many wheelchair bathrooms because they can be attached at the required height and they allow clearance space for a wheelchair approach and transfer. Choose a toilet lift seat if necessary. If it is particularly difficult to transfer from a wheelchair to the toilet, an electric power toilet lift seat may be the answer. They are adjustable, portable and easy to use. Install a personal hygiene system. 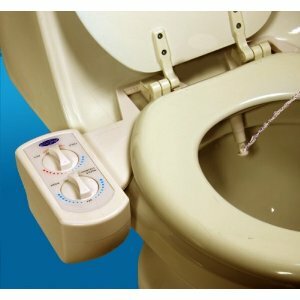 To help promote as much independence as possible for those who are particularly immobile, a personal system such as a bidet can be very helpful. An electric bidet or a modern version of the same, called a paperless toilet, can be installed to provide excellent hygiene for the disabled. Many handicapped bathrooms in the UK are equipped with combination toilet/bidets that come complete with a drying mechanism. should be made when remodeling or building a truly wheelchair accessible bathroom.